JP 2013-12-04 ¥286 (300) ? Sonic the Hedgehog (ソニック・ザ・ヘッジホッグ) is a Sega Master System and Sega Game Gear "8-bit" counterpart to the Sega Mega Drive game of the same name. It was released in October and December 1991, respectively. 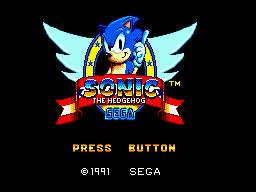 The 8-bit Sonic the Hedgehog is a very loose "port" the Mega Drive version, with similar, albeit simplified gameplay and a partially different set of levels (all with new layouts). Though overseen by Sonic Team, most of the game was created by external development studio, Ancient, in their first collaboration with Sega. This version of Sonic the Hedgehog also stands as the first handheld Sonic game. As was the norm with the early Sonic games, the plot is simple. Dr. Eggman is menacing South Island and imprisoning animals in badniks; the heroic hedgehog sets out to defeat him, potentially collecting 6 Chaos Emeralds along the way. After Sonic fights his way to Scrap Brain Zone, Eggman's factory-city on South Island's summit, the Doctor escapes to an airship (Sky Base Zone), where Sonic finally defeats him in the last boss fight. Eggman escapes by teleporter; Sonic jumps in after him and is transported back to Green Hill Zone. If the 6 Chaos Emeralds have been collected, the gems then spiral up into the air and cleanse the black smog and pollution off the island. The gameplay is similar to that of the Mega Drive version. The Sonic's abilities and the items available are the same. Although the gameplay is similar, it is slower than its 16-bit counterpart. There are some differences however: Checkpoints take the form of point arrow monitors rather than posts. Chaos Emeralds aren't found in special stages; rather, one is hidden in each of the six regular zones. The Special Stages exist merely as a bonus stage where players can collect Continues and Extra Lives, and no additional reward is given for collecting all items. Three of the zones come from the Mega Drive version of the game. Bridge Zone and Jungle Zone are considered unusual today for Sonic the Hedgehog zones. However, this was Sonic's second game, so such norms hadn't been established yet. Each zone has three acts. The first two acts are standard levels, but the third act is merely a short run up to the boss and contains no rings. The three zones titled after their Mega Drive counterparts feature 8-bit renditions of the scenery, but have unique level layouts. Like in the Mega Drive version, the player can collect 100 rings to earn an extra life; but in the 8-bit version, the ring counter resets to 00 rather than increasing past 99. Additionally, rings dropped after taking a hit cannot be re-collected. Eggman: No prize. This panel comes up most often in the game, provided the player's ring count is below 50. Ring: 10 rings added to final ring tally. Only awarded if you end the act with 0, 10, 20, 30 or 40 rings. You can't get this panel in Scrap Brain Zone, nor in Sky Base Zone act 1. However, it always appears in Sky Base Zone act 2. Sonic: Extra life. Comes up rarely, only if you end the act with an amount of rings that varies from act to act. Unlike in Sonic Chaos, beating an act with no hits taken doesn't trigger it. Exclamation Point: Special Stage. Appears if 50 or more rings are on hand when passing the sign. You can't get this panel in Scrap Brain Zone nor in Sky Base Zone. The Game Gear version has a smaller screen resolution, but a higher color palette. Sonic's sprite is smaller and the control feels lighter. In the first zone of the Game Gear version, warning signs have been placed as the high speed combined with the narrow screen can cause problems. Jungle Zone Act 2 allows for vertical descent without losing a life in the Game Gear version, which makes this stage easier. Labyrinth Zone's level design is different in the Game Gear version as well, with the Chaos Emerald now in a new location. Several bosses, including the final, were modified or even replaced, making them easier than their Master System counterparts. The bonus stages were also redesigned. The Game Gear version uses a Sega splash screen with a jumping Sonic sprite, whereas the Master System version lacks a Sega splash screen entirely.